London Grove was set up in 1724 by New Garden Monthly having functioned as an indulged meeting since 1714. Meetings were held n the homes of members until 1724 when the first meeting house, built of logs, were built near the site of the current meeting house. 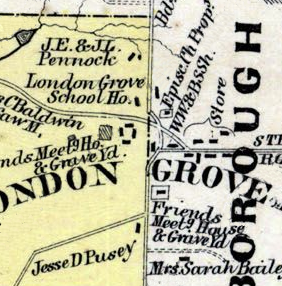 When London Grove Monthly meeting was established in 1792, this meeting became part of it. 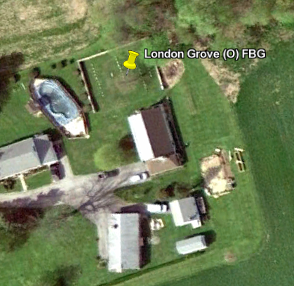 At the time of the Separation, the Hicksite branch of London Grove Monthly retained the two story natural stone meeting house, built in 1818, and the property surrounding it, including the burial ground. The membership of the preparative meeting and London Grove Monthly meeting had become identical near the beginning of the 1900's, so the preparative meeting was laid down in 1912. The Orthodox segment of the meeting met in members' home until 1834 when they built a meeting house and created a burial ground just south of the original meeting on Newark Road. The burial ground can be seen in aerial photographs. The pictures attached below show an 1873 Atlas page showing the two meetings, as well as modern mappings of the same area.